tool consists of a split die block, which has holes for 3/16-, 1/4-, 5/16-, 3/8-, 7/16-, and 1/2-inch OD tubing; a clamp to lock the tube in the die block; and a yoke, which slips over the die block and has a compressor screw and a cone that forms a 45-degree flare or a bell shape on the end of the tube. The screw has a T-handle. A double flaring tool has the additional feature of adapters, which turn in the edge of the tube before a regular 45-degree double flare is made. It consists of a die block with holes for 3/16-, 1/4-, 5/16-, 3/8-, and 1/2-inch tubing; a yoke with a screw and a flaring cone; plus five adapters for different size tubing, all carried in a metal case. SCREWDRIVERS A screwdriver is one of the most basic of handtools. It is also the most frequently abused of all hand tools. It is designed for one function only  to drive and to remove screws. not be used as a pry bar, a punch. STANDARD There are three main A screwdriver should scraper, a chisel, or a parts to a standard screwdriver. The portion you grip is called the handle, the steel portion extending from the handle is the shank, and the end that fits into the screw is called the blade (fig. 1-47). 1-28 Figure 1-46.-Flaring tools. 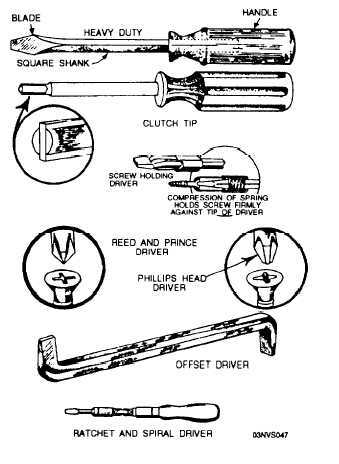 Figure 1-47.-Types of screwdrivers.